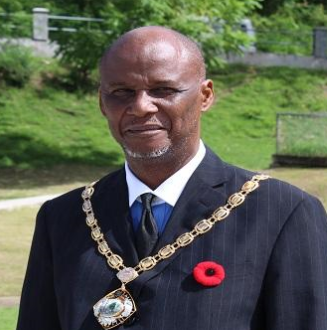 Castries Mayor, Peterson Francis, has said that he is unaware of the reason for a protest Monday by employees of the Castries Constituencies Council (CCC). Employees of the CCC’s Sanitation and Works Departments downed tools asserting that they were unhappy with plans to implement a shift system and extend their working hours. “I came in this morning and I saw a few workers in the yard with the press around. I mean, I did not know what was happening. I had not gotten any notification from their representative,” Francis told St Lucia Times. “Up to now I do not know the reason for workers not being at work this morning. I am still at sea as to what has happened,” the Castries Mayor said in an interview shortly after noon on Monday. He said he had heard that one of the grouses of the employees related to a shift system. But Francis said the system had been negotiated with the union. “On the panel, apart from the union officials, we had three Shop Stewards,” he told St Lucia Times. The Mayor than proceeded to read from what he said was Article 6 of the signed agreement, relating to hours of work. Francis went on to quote the document as saying that the daily hours of work shall be set out in a written schedule or roster issued by the employer. He declared that he was at a loss to understand now that there is an issue over a shift system that started on Sunday. How come the mayor has the ARTICLE so pat down but he does not know that the workers are being paid regular pay for their weekends? If the workers are expected to work and 40 hour week then is not anything beyond forty hours paid as time and a half or double time? So what business is this about a shift system? Is the mayor actually clueless? It is 2019 Mr Mayor! Get with the program please! It is apparent from the Mayor’s remarks that the Shop Stewards (the go-between the Union and the employees) did NOT do their work on imparting the new agreement in the proper manner. As far as I can see, the Mayor is not to blame, but the Union and the Shop Stewards have some answering to do – and quickly! It is probably the manner in which the “memo” was meted out that is the problem. And now it is the Mayor to answer for other people’s (Union and Shop Stewards) slovenly actions? I think not. This section contravenes the Labour Code. Meal breaks ought to be calculated in the 8 hours of work. The one hour for lunch is inclusive in the 8 hours of work per day. Why people like this egotistical, narcissistic mayor want to violate the labor laws. St. Lucia is of present a place where depression, misdirection and confusion reign. any day, **exclusive** of the meal interval, as an ordinary work day. (2) An employer and employee may in a contract of employment agree to flexible hours of work which do not exceed forty hours per week. A word of caution to the Mayor. You must not base your stance in this situation on your ill conceived premise that , according to you ” St. Lucians assume that workers’ have a right to do as they please with scheduled lunch breaks . Mr.Mayor, you are missing the proverbial mark when you preside on this industrial dispute by making such baseless pronouncements,albeit with such fervor. It is evident that either you are misinformed by your in-house Human Resources Manager, or you choose to usurp the inalienable rights of Council employees.Perhaps you would be better advised to consult the Labour Department for guidance on this issue. In the meantime, for the benefit of Council and Council Employees , be informed and guided by the fact that a one (1) hour PAID Lunch Break is a benefit that accrues to hourly paid employees for EVERY seven(7) hours worked. This entitlement can, by mutual agreement between the employee and employer, be broken down between mid morning and mid afternoon breaks (say 15 min. respectively) , and half hour for lunch. The sum total of these elements constitute an eight hour shift. This means that technically, if , based on the exigencies of the work of Council, an employee agrees to work (perform JOB DUTIES) during the scheduled lunch break, That should attack overtime pay at “time and a half”. Based on the foregoing, the common arrangement whereby , employees are required to work through their lunch breaks, on the premise that the work day will end one hour earlier. does not change the full work shift in any way whatsoever- it essentially remains an eight hour work shift. By the way why Sandals will not allow it’s employees to be unionized? Dominic Fedee please let us know your stand on this.